Help focus your mind and foster your creativity. Increase your resiliency and well being. 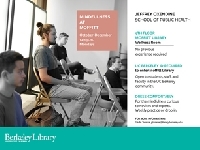 Join Jeffrey Oxendine of the School of Public Health for mindfulness practice. All experience levels welcome; weekly practice or drop in attendance also welcome. Mondays from noon to 1pm.